J, ρ, and l remain constant for any line factors. The lines drops can be reduced by raising the temperature to a higher level. The power factor of a system explains the relationship between real and reactive power. Lower power factor results in a larger capacity of generators as well as a large number of drops in transmission lines. 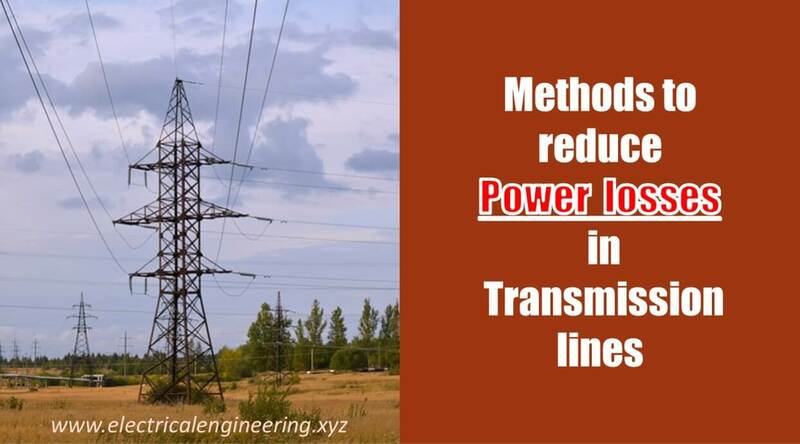 Line power losses can be considerably reduced by improving the power factor. An LV power line carries electrical power without corona losses. However, in case of HV voltages, significant coronas result in power losses. These power losses can be avoided by using Bundled conductors which are the multiple conductors per phase. The cleanliness of transmission line conductors is greatly influenced by External environmental conditions, pollutants, dust particles, and industrial chemicals coming from factories. Such pollutants contaminate the body of conductors, as well as they, reduce the efficiency of transmission lines. Proper maintenance of conductor improves transmission line efficiency and increases the lifetime of conductors. The concentration of ac current near the surface conductor is known as skin effect. Skin effect reduces the effective cross-sectional area for current flow. The skin effect is less in stranded conductors as compared to solid conductors. It can also be reduced by decreasing the diameter of the wire.